Vivian Jones, Stevie’s mother, has written an updated narrative with full details on the actions taken in Stevie’s case. On April 26, 2012 Stevie was returning from a cross county trip, traveling alone by Greyhound bus to NYC from Hot Springs AK. 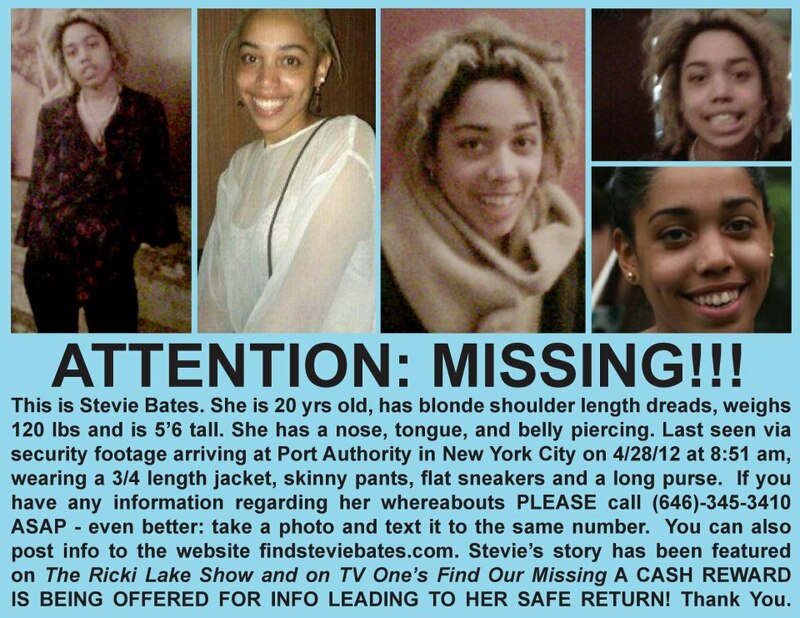 I last spoke with her at 7:52 pm on 4/27/12 while she was at a layover bus stop in PA. I was able to view surveillance cameras at NY Port Authority which showed her coming up the escalator from the Greyhound bus at 8:51am and walking downtown on 8th avenue from 42nd st on 4/28/2012. Stevie has a very distinct look of shoulder length hair that is dyed blonde and in dread locks. When I last spoke with Stevie on 4/27 she specifically told me that when she arrived in NYC she would stop in Brooklyn to meet up with her ex boyfriend, Brandon Klosterman, and come to the house the next day. I have not heard from or seen her since. None of her friends have seen her. She’s had no activity on Facebook since April 26, 2012 (when she had a Facebook conversation with her ex boyfriend Brandon Klosterman, who she would be meeting up with in Brooklyn as soon as she arrived in NYC ). Her other conversations on Facebook were with her best friend (whom she made plans to meet up with for spring break), and a few other high school friends. The friend she was to meet up with, Brandon Klosterman, claimed he hadn’t seen her since before she left NYC on April 19, 2012 to begin her travels. She has not had any activity on her card since April 26, 2012. Stevie NEVER goes without calling me. NYPD said she was 19 and could go as she pleased, (regardless of the fact that I told them my daughter Stevie never ever goes without calling me). They also said that since I didn’t have any proof that she even made it to NYC (because when I last spoke with her she was at a layover stop in PA), that I should contact NYC Port Authority. NYC Port Authority redirected me to PA Port Authority. PA Port Authority redirected me to Arkansas where she first boarded the greyhound bus to NYC, (even though I told them I spoke with her while she was in PA at the layover). Arkansas verified that she boarded the bus and redirected me back to PA Port Authority. PA Port Authority redirected me the PA Police Department. The PA Police Department verified via video surveillance that Stevie re-boarded the bus in PA heading to NYC and, they redirected me back to NY Port Authority. NYC Port Authority then redirected me back to NYPD. NYPD then redirected me to Yonkers, because I told them I had just become a Yonkers resident (even though I told them Stevie lived in NYC with her sister). By this time I was frantic and frustrated with the run around I was receiving, so I finally filed the Missing Persons Report in Yonkers. Two weeks later when Yonkers finally got around to going down to NYC to check the video footage, we verified that she did make it into NYC. I then made several attempts via phone calls to precincts and walk-ins to precincts, to get the case transferred to NYC. NYC said they couldn’t duplicate the Missing Persons Report and that Yonkers had to follow up on the case. Due to Yonkers limited resources and a lack of effort, many crucial opportunities were missed (like crucial video surveillance up and down 8th Ave and the subway stations) which could have helped us track her steps and follow any leads that may have shed light on what happened to her and where she went after leaving Port Authority on 4/28/12. My daughter’s case should never have been pushed off to Yonkers. 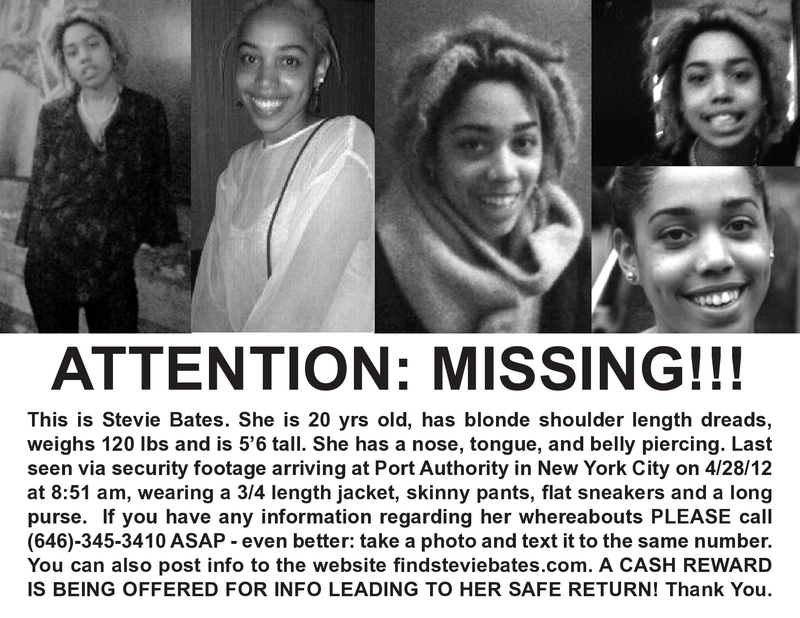 She is an NYC resident and she was last seen via video footage at NYC Port Authority therefore NYPD should be handling her case. Family and friends: Please click on the link above in order to participate in Sunday’s event. Dear friends – please help spread the word by printing and posting this flyer any and everywhere, both in cyberspace and in the real world. This has updated information for 2013. Many thanks. Thanks to all of our followers and readers for watching and commenting on this episode. TV One will air an encore showing on January 20 at 1PM or Sunday, January 27 at 2 PM (Eastern Time) or you can click on the link below. We thank you for sharing and spreading Stevie’s story far and wide.